And I’ve tried to live up to this person. Oh, how I’ve tried. I have also fallen short on several occasions. For years, I had a bucket list that gathered dust because I was deep in debt. Once I got out of debt, I went on my first beach vacation and ended up watching too much TV, with the beach on one side of my rental and a bike path on the other. Last year, I attempted to bicycle around Vermont using Adventure Cycling Association maps. I biked for two days and called it quits on a painfully long and steep hill. 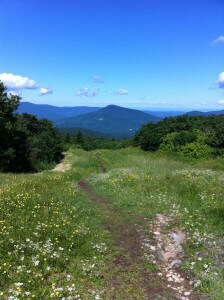 This year, I went out on the Long Trail, a 272 mile path along Vermont’s Green Mountains. I made it 60+ miles battling bum shoes, broken tent poles, a too-heavy pack, and physical activity beyond my ability. Amidst all of these “failures” – this is where we start using quotes around that word – I learned how to work the experience. You may even need to write the thoughts down – get them on paper and out of your head. If the thought is “I can’t afford this,” move that to “I am saving up money to make this happen.” If you feel like a quitter, at least give yourself credit for dreaming, for starting. This is where you write your own story, the story of your life, really. So don’t make yourself the villain: you should be the hero! Flip every negative comment into a positive or constructive assessment. Take stock. Write down or verbalize every lesson you learned, from the most basic, tactical lesson to the larger questions about yourself and life. Don’t continue to wallow in the “failure” and don’t, either, just bask in the glow of the lessons learned. Design your next step, whether that’s trying to achieve your goal in another way, preparing better for a second try, or moving on to another bucket list goal. If you’re the hero of your own story, don’t make it a one-act play, make it an epic! Failure can be quite beautiful on top of Bromley Mountain, Vermont. Maybe your bucket list was the brainchild of a younger you and it no longer fits. Maybe, by learning what you don’t enjoy, you’ve freed up resources for other things you do enjoy. Or maybe it’s time to change everything, because the person your bucket list reflects is the person you want to be. It’s true: I haven’t completed the Long Trail – yet. But I know what I need to do for next summer. And the bike trip has a new deadline. I’ve also conquered my debt and am living a life I love, even if it sometimes means watching too much TV on a beach vacation. There aren’t too many “failures” when it comes to your bucket list. There are, however, bumps, bruises, scrapes, lateral moves, and lessons learned. But if you see that as part of the fun, your bucket list will teach you lessons and provide you with unexpected adventures for the rest of your life.